Here's a great view of WinNtrak's clubhouse, taken by long time WMRC member John Longhurst. All aboard for a WinNtrak open house this weekend! Their clubhouse and layout will be open to the public between 1:00PM and 4:00PM on Saturday, August 20 and Sunday, August 21. Their clubhouse is located in the parking lot of the Prairie Dog Central complex (that's right behind their freight shed). While you're there, you might want to take a ride on the Prairie Dog Central itself! But check their website first to see if tickets are still available! For directions on how to get there, click here. 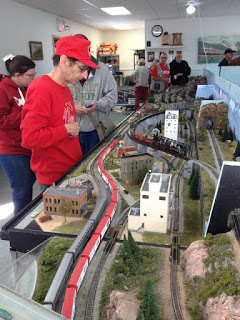 Russians invade the Winnipeg Model Railroad Club!